Leaders of the SCO countries in China for the 2018 summit. Two years after its expansion to include India and Pakistan, the Shanghai Cooperation Organization (SCO) will face a big challenge at its 19th Summit of Heads of State in the capital of Kyrgyzstan, Bishkek, on June 14-15. In light of the recent upsurge of violence between India and Pakistan, the security grouping must clarify its stance on potential future conflicts between member states in order to retain its international credibility. Founded just three months before the 9/11 attacks in June 2001, the SCO was established by China, Russia, and the Central Asian states of Kazakhstan, Kyrgyzstan, Tajikistan, and Uzbekistan. The grouping aimed to cooperate against nontraditional security challenges, in particular fighting the so-called “three evils” of terrorism, separatism, and extremism. Unsurprisingly, the decision to accept both India and Pakistan as full member states in 2017 was received with skepticism by experts both inside and outside the region. The fact that the SCO also strives to strengthen mutual trust and good neighborly relations between its member states further led many to forecast that the expansion would lead to the organization’s failure rather than an amelioration of India-Pakistan relations. 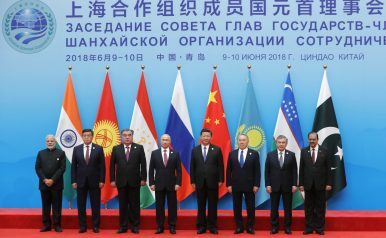 Why, then, did the SCO accept India and Pakistan as full members? A major reason for China, arguably the grouping’s most dominant actor, was its desire to flaunt its power, demonstrating the ability to lead an international organization. As the Bertelsmann Transformation Index (BTI) 2018 writes: “In recent years, China has increased efforts to be considered a reliable member of the international community and a dependable partner in bilateral relations.” In this context, the BTI points to the country’s strong commitment to existing international institutions such as the UN, but also to the initiation of brand new mechanisms such as the BRICS New Development Bank and the Asian Infrastructure Investment Bank (AIIB), which is considered by some as an alternative to the World Bank. The Shanghai Cooperation Organization, as the first multilateral organization ever created by China, is another case in point. Including its regional rival India and its “all-weather friend” Pakistan into the SCO helped China turn the organization from a grouping largely disregarded beyond the region into the largest regional organization both in terms of its geographical coverage (over 60 percent of the Eurasian landmass) and population (almost half of the world’s population) with its collective gross domestic product amounting to almost 25 percent of the global total. It goes without saying that the expansion has given a boost to the SCO’s international profile. However, it has also become more important for China to score success with the organization, the first multilateral organization it has forged. The most recent India-Pakistan flare up in the decade-long conflict was triggered by a suicide attack on an Indian paramilitary convoy in the Pulwama district of Indian-administered Kashmir in February, which killed 40 and was claimed by the Pakistan-based Jaish-e-Mohammed (JeM) group. This led to Indian airstrikes on a JeM training camp in Pakistan, marking the first time since the 1971 Indo-Pakistan war that strikes were launched beyond the Line of Control, which is the de facto border between the Indian and Pakistani controlled parts of disputed Kashmir. The escalation of tensions between the two nuclear powers is the first high-level military conflict between current SCO members and poses a serious challenge to the 18-year-old organization. After continued exchanges of fire, both Russia and China offered their assistance in defusing tensions and proposed using the SCO Regional Anti-Terrorist Structure (RATS) as a suitable platform. How this would be done, however, remains unclear. This is the core of the problem. So far, the SCO has gotten away with publishing ambiguous statements concerning its primary motivation. A good example of the noncommittal wording is the 2010 revolution in Kyrgyzstan, which saw violence between ethnic Kyrgyz and Uzbeks in southern Kyrgyzstan. Despite appeals by the Kyrgyz government for Chinese and Russian help, the organization issued vague statements calling for the preservation of stability. This was usually justified by emphasizing the SCO’s short existence and the need for its member states to first “grow into” the organization. Many now claim that the SCO has reached maturity, making it paramount that it adopts a more assertive stance in its field of expertise – improving the regional security situation. Within this context, the upcoming SCO Summit will be a litmus test of the organization’s future significance. If its members really want to tout the SCO’s role as an efficient international institution, it will need to do more than making ambiguous declarations. Instead, the SCO will need to meet its new responsibilities head on. It needs to create a roadmap to ease India-Pakistan tensions and play a role in changing their relationship, if only to ensure the SCO’s continued existence. One approach would be to form a short-term Contact Group, similar to the SCO-Afghanistan Contact Group, as a mediation instrument. The group could be comprised of one representative of each member state as a vehicle to help the Indian and Pakistani members overcome their stalemate. Something needs to change. Only by strengthening its ability to contain conflict, and by shouldering the responsibilities that come with its expansion, can the SCO earn itself the seal of international credibility. Eva Seiwert is a doctoral candidate at the Graduate School of East Asian Studies (GEAS) at the Freie Universität Berlin. Her research focuses on China’s foreign policy towards Central Asia, in particular within the context of the Shanghai Cooperation Organisation. She can be followed on Twitter @evaseiwert.